Daily Debate: Is Amiibo Just Another Form of DLC? With the release of the fantastic The Legend of Zelda x Mario Kart DLC last week for Mario Kart 8, it’s clear that Nintendo has come to terms with a feature of modern gaming that many of us love to hate. While those who have played the aforementioned pack are unlikely to say this was a mistake, this Friday will see the release of a new Nintendo experiment in North America; and it’s name is amiibo. Despite having gone through a noticeable drop in quality since they were unveiled at E3, amiibo figures are still very much in demand, and with a third wave due out in February, Nintendo is clearly confident that they will remain popular, at least for a little longer. While some just can’t wait to get their hands on the Link, Zelda, Toon Link, Sheik, and Ganondorf (whenever he’s announced) figures, there are certainly those who have their qualms with this new addition to their most anticipated games, and with good reason. 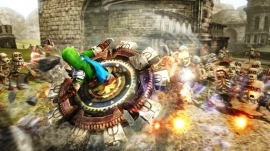 It wasn’t long after we learned that the Link amiibo would work with Hyrule Warriors that we found out it would do so by unlocking a brand new weapon. It’s hard to imagine that those who have Hyrule Warriors won’t have either Mario Kart 8 or Super Smash Bros. for Wii U (or 3DS, as amiibo compatibility will eventually come to the handheld), but if they don’t the weapon essentially costs the player a whopping $12.99. Having content placed behind price locks like this certainly isn’t new – to DLC, that is. Never has Nintendo called their upcoming line of toys-to-life character figures DLC, but their implementation and use rings very familiar to the much-despised feature. As I see it, it’s strategically smart and is a great way to circumvent the hatred surrounding it, not to mention a fairly decent value for those who are planning to use them in multiple games. However, Nintendo has a track record of being fairly good with allowing consumers a choice in their games and content, so why can’t some of these features be purchased separately? While I understand the case for the figure player use in Smash Bros. it makes little sense to force a consumer who only wants to purchase the Spinner weapon to have to go above and beyond the price worth of the item. So how should we classify these figures? 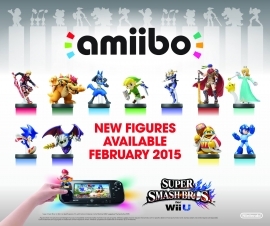 Is amiibo just another form of DLC hidden behind the faces of friendly Nintendo greats? Or has Nintendo truly created a new form of content that can’t be directly compared to it? While I believe it falls under to former description, I’ve already happily ordered a handful of amiibo and look forward to using them in all three of their compatible titles, but perhaps I’m not looking at it quite right. What’s your take? Join the daily debate!